According to the 1851 census, Samuel was born in Alstone in 1794. Unfortunately there is no entry in the Alstone parish records for a Samuel Paynter. However, there was a Painter family living in an adjacent hamlet in 1800 for a William Painter was baptised at Alstone in 1800 and a Charles Painter in 1802 having been born in Little Washbourne. We believe that the Painter family moved to the area of Alstone in about 1799 when Samuel was five years old and this is why he believed he was born in the village. If this is the case, then his father would have been Willliam Painter and his mother Elizabeth. Further research of neighbouring villages may well throw up further details. 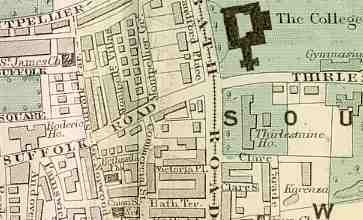 Samuel and Esther were living at 10 Union Street, Cheltenham on census day 1851. Although the writing on the census form is extremely hard to read, we believe that Samuel came from the village of Alstone, just north of Cheltemham, and Esther his wife came from Cowley, just south of Cheltenham. At that time, both Samuels, father and son, were employed as carters. Union Street is a short road next to Bath Terrace and just a few hundred yards south west of Cheltenham College.